The Mughal empress was known to have a rich library. It is well established that the Mughal royal ladies were highly educated and could read and write in several languages. For example Babur’s daughter Gulbadan wrote her own autobiography (A Mughal princess’s autobiography) and Princess Jahanara completed a life of the Sufi saint Muʻin al-Din Chishti (Princess Jahanara’s biography of a Sufi saint). We also know from contemporary sources and inscriptions that they were book collectors with their own libraries. Perhaps the best-known of these was Hamidah Banu Maryam Makani (d. 1604), wife of the Mughal emperor Humayun (r. 1530–40; 1555–56) and mother of the emperor Akbar (r. 1556–1605). The British Library has one of 13 known manuscripts which belonged to Hamidah Banu (Das, Books and pictures). 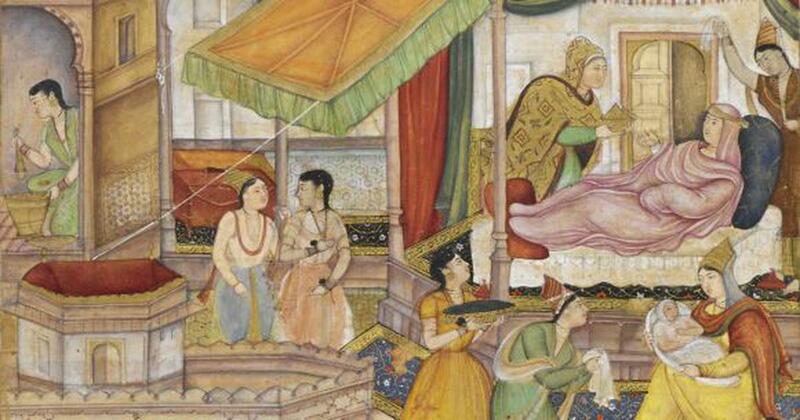 This is the little-known Dīvān-i Hijrī, a collection of poems composed mostly in honour of Akbar. The author is likely to be one of Akbar’s court poets, Khvajah Hijri who was described by the contemporary historian Bada’uni (Muntakhab al-tavārīkh , vol 3). Hijri was descended from Shaykh Ahmad-i Jam Namaqi, as was Hamidah Banu herself – and this might explain why she had a copy. Bada’uni described him as “very pious, chaste, and pure, and had an angelic disposition.” His dīvān apparently consisted of 5,000 couplets of which Bada’uni quotes several long extracts. The British Library copy, consisting of 80 pages each containing a maximum of 17 couplets, is much shorter, but to my knowledge, no other copy is known to compare it with. Hamidah’s 12-lobed petal-shaped seal is stamped at the front of the volume and reads Ḥamīdah Bānū bint ʻAlī Akbar, 957 ‘Hamidah Banu daughter of ʻAli Akbar, 957 (1550/51)’. It is known to occur on five other manuscripts and was also apparently used as an official seal on documents (Tirmizi, Edicts, pp. 2-10). In contrast, Hamidah’s second seal, dated 968 (1560/61) is square-shaped, inscribed with her name Hamidah Banu Begam and a legend which plays on the two words muhr‘seal’ and mihr ‘ love’, loosely translated as ‘Let her seal be the love which signifies affection, let her seal be the mirror of the face of good fortune’. This second seal occurs on two of the most valuable manuscripts of the imperial collection both graded as ‘First Class’: the Khamsah of Navaʼi (RCIN 1005032) and the anthology of Mir ʻAli (NMI 48.6/11). The Dīvān-i Shāhī shown above (CBL Per 257) although only graded as ‘Class two, grade one’ had belonged apparently to Shah ʻAbbas and included the personal inscription of the Emperor Jahangir. For a detailed history of these manuscripts as recorded by their seals and librarians’ inscriptions, see John Seyller’s “Inspection and Valuation”. It is sufficient here to note that the manuscripts with the earlier seal share many similar features. Three are graded “Class three” and they were all transferred from Hamidah Banu’s library to the care of one Mulla ʻAli in 1604 within a few weeks of her death. In addition they have inspection dates and seals in common which suggest that they may have followed a separate trajectory from the other manuscripts Hamidah Banu is known to have owned.